Veteran wildlife photographer Wyman Meinzer shares images of his rarest finds. For half a century, my wanderings throughout the vast state of Texas have offered many opportunities to encounter subjects of intrigue, whether they be skies, landscapes, cultures or wild creatures indigenous to the land. With a camera in tow, I have tried my best to document these interesting features and have collected hundreds of thousands of images that define much of what I have seen. Perhaps the most unusual subjects are found within the diverse menagerie of our natural fauna — specifically, genetic anomalies of coloration that occur periodically in all species. In this photo essay are examples of a few that I’ve encountered during the 4O-odd years of my time with camera in hand. Albinism: Rare condition characterized by little or no color in the skin, hair and eyes. Melanism: Abnormal development of dark pigmentation in the skin, hair, feathers, etc. Leucism: Condition characterized by white or patchy coloration of the skin, hair or feathers, but not the eyes. In 1993 I was out on the Llano Estacado shooting images for a book project on playa lakes. These bodies of water are magnets for a wide diversity of bird species, not the least being red-winged blackbirds. In one of my travels onto the High Plains, I drove past a grain field and observed a very large flock of red-winged blackbirds flying in formation. 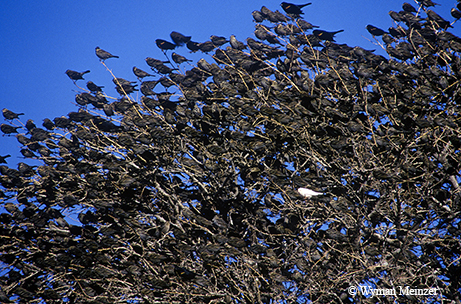 They soon landed in a solitary tree, en masse, creating a virtual wall of dark feathers against the cloudless blue sky. A contrasting element caught my eye, and upon closer inspection, I was astonished to see a single snow-white albino blackbird in the flock, pink eyes and all! In the wild community, albinism is a rare anomaly in which a creature’s body does not produce melanin, or pigment cells. Unlike leucism, which also causes light coloration but is accompanied by low levels of melanin, albinistic creatures do not exhibit pigmented features and instead exhibit white feathers or fur and have an aberrant eye color, usually pink. It is rare to encounter two color anomalies, much less of the same species, even in a lifetime of venturing in the wilder areas of our great state. In this case, I was fortunate to see and photograph the golden-fronted woodpecker in both melanistic and leucistic phases of color, although many years and several miles apart. Melanism is a genetic mutation that causes the feathers to have a higher concentration of melanin, resulting in a darker pigmentation than the normal color scheme of the species. 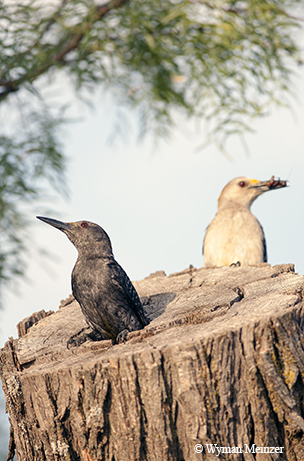 In this photo of a nesting pair of woodpeckers, one with a melanistic phase emerges from a nest that is located in the decayed center of an old mesquite tree. Some theories suggest that melanistic creatures are more likely to survive predation due to their darker, more camouflaged coloration. This particular woodpecker flourished in the same area for three years before finally disappearing, not to be seen again. 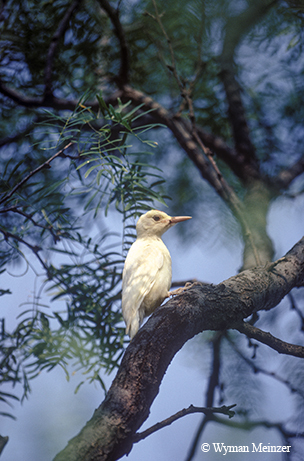 The woodpecker with the leucistic color phase was photographed many years earlier and perhaps 20 miles north of where the melanistic bird was found. 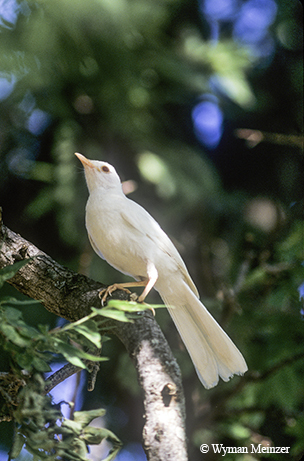 Leucism produces light-colored feathers in birds, and the still-present (but lower-level) melanin allows for the dark eye coloration that is absent in albinism. I saw the white woodpecker only once, and was able to grab this image before it fluttered away through the mesquites. Having been scientifically recorded in Texas only six times by 1994, the patternless diamondback rattlesnake is possibly a genetic anomaly specific to certain regions in the state. Two specimens were collected in Haskell County, two in Williamson County, one in Comal County and another from an unknown area. More recently, another specimen, shown in this photo, was found in Haskell County in 2007. The snake exhibits the normal physical features of a rattlesnake — pit viper head and rattle — but the coloration of this patternless specimen is distinctly different from the typical diamondback. 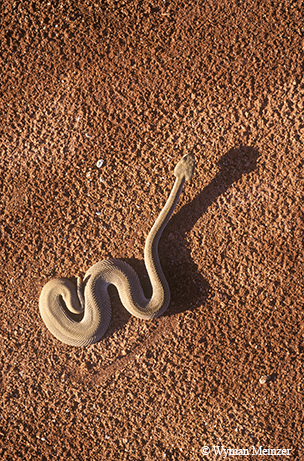 With uniform light brown skin coloration and no diamond configurations, and a black tail instead of the black and white rings, the reptile has the color attributes of certain racer snakes. 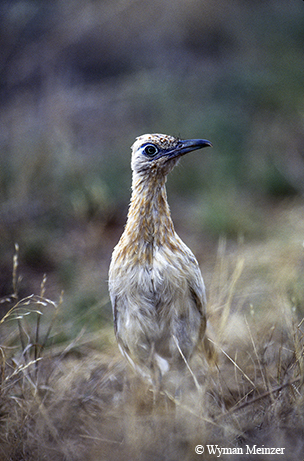 One early morning many years ago, a cowboy approached me for conversation, intimating that he knew where a “white roadrunner” was hanging out. I suggested that he contact me as soon as he saw the bird again, and within a few days he called to say the chaparral was snooping around his house and barn. Within a few minutes of arriving at the location, I spotted the cream-colored leucistic paisano and spent over an hour photographing the creature, knowing well that the color aberration would make the bird susceptible to predation. After the photo session was over, I never saw the bird again, but I was satisfied in knowing that I had immortalized this avian oddity on photographic medium to someday share with a reading or viewing audience. 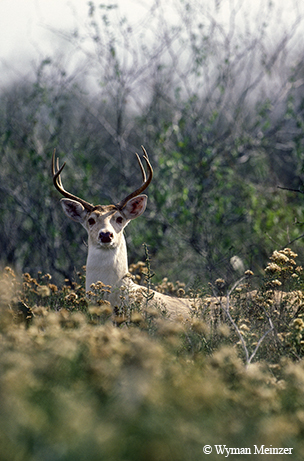 During the whitetail rutting season some 30 years ago, while photographing in South Texas, I was on a ranch near Riviera “rattling horns” in an attempt to attract a buck to my location. Within a few minutes I was startled to see this young buck approach close enough for a photo. The buck shows evidence of leucism, characterized by white hair. Although light in body color, leucistic creatures still possess the body cells that produce melanin, thus the dark eye coloration. After walking into the Benjamin post office one day several years ago, I was summoned by the postmaster and informed that he had recently seen a white mockingbird near his home, only a couple of blocks away. Since his last sighting was on that very morning, I grabbed my Canon 500mm lens and headed down the road. Within minutes I could see the state bird of Texas and observed that it was a true albino that was almost snow white and exhibiting the characteristic pink eye coloration. It took me several attempts to photograph the bird because of its desire to stay in the shadows, perhaps aware that its unusual coloration would make it more vulnerable to predators. Sure enough, I never saw it again after that day.